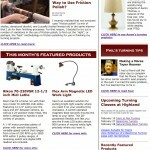 Welcome to 2016 with a brand new issue of The Highland Woodturner, Highland Woodworking’s newsletter geared toward turners from beginning to advanced! A Case for Prototyping: The Vise Project– Curtis Turner discusses a recent project where he turned a new round handle to replace one of his customer’s traditional vise handles. In this article, Curtis discusses his process for the project as well as the problems he encountered while working on the project. Should friction polish be applied with the lathe running or stopped? What type of applicator should the polish be applied with? What speed should the lathe be running while polishing? How much sanding is enough for the friction polish to make a high-gloss finish? Show Us Your Woodturning- Aaron Thomas– Aaron is a disabled war veteran who has turned to woodworking, specifically turning, in order to help him cope with PTSD. He specializes in Native American Flutes, as well as table lamps, standing lamps, and oil lamps. Phil’s Turning Tip: Making a Morse Taper Reamer– If you have a morse taper that won’t sit properly in the quill, you’ll want to check out Phil’s tip on making a reamer to clean the quill. Rikon 70-220VSR 12-1/2 inch Midi Lathe– If you’re looking for a new lathe to replace your old one or to get started in woodturning, the Rikon 70-220 is a great solution, which is designed to handle a wide variety of projects. Flex Arm Magnetic LED Work Light– One of our most popular items, this work light will help save your eyes and brighten up your workspace for improved accuracy.